Ever planned for one of those quiet nights at home on a Friday night? Your popcorn is popped, a movie has been selected and your bum has been plopped onto your comfy couch. Just as the intro music begins to play and the first character is introduced, you see it; three inches away a blinking light appears and continues to flash on and off. And so it begins. Your quiet night has turned into nerve-wracking and unproductive hours spent refreshing newsfeeds and reading emails that flood your inbox. Suddenly, you’re suffering from the fear of missing out. “As soon as I hear my phone ring or feel it vibrate I don’t think twice about picking it up,” says 16-year-old Amelia DeSilva. She, along with many other young people admit to putting whatever they’re doing at the moment on hold in order to check-in with social media and emails. This self-imposed need to constantly be in the know has led to a compulsive concern of missing out on something or someone more exciting, which has coined the term “fear of missing out” or FOMO. This blend of anxiety, inadequacy and irritation that flares up when using social media makes people miss out on the present and lose the ability to enjoy what’s going on around them. It’s hard to remember a time before smart phones and social media. Our routines have developed into waking up to a bright cell phone screen instead of the bright sun that’s outside our window. With the rise in social media, we can keep up to date with our friends’ activities 24 hours a day. Now that we can instantly connect and consume the latest news and gossip, life online and offline has become increasingly intertwined. 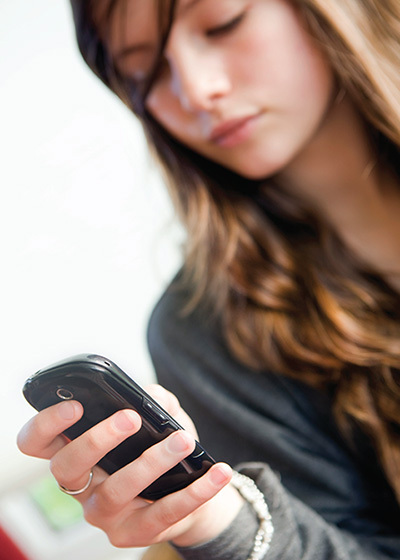 According to a 2013 study by Dr. Andrew Przybylski at the University of Essex in the United Kingdom, young people with FOMO email, text or use social media during key times of the day, like right after waking up, before going to sleep or during meals, check social media accounts during classes or parties, pay more attention to their mobile phones while driving and report lower mood and overall life satisfaction. This FOMO phenomenon is most commonly experienced by those under 30, and almost every millennial can confess to interrupting a face-to-face conversation in order to answer a call or check a status update. People are exposed more to what others around them are doing and are, as a result, filled with a gnawing uncertainty about whether they’ve made the right choice about what to do and where to be, not just in any given moment, but in stages of their lives as well. As a result of this obsessive checking behaviour, people are putting themselves in dangerous situations like looking at phones while driving, and generally centering their lives around technology rather than creating genuine social connections in-person. Scrolling through newsfeeds and dashboards make people feel inadequate, that they should be out there living life to the max like everyone else appears to be. Pictures are photoshopped and statuses about cool, interesting and special moments are shared. People are exposed to really awesome VIP events and fun birthday parties, but are not shown waiting at the doctor’s office, getting stuck in traffic and taking an hour to get ready in the morning. The boring and mundane aspects of life are kept a secret while doing once in a lifetime things, like zip lining in Mexico or surfing in Fiji, are the ones broadcasted. For every picture of a meal at a five star restaurant, there should be 100 pictures of the Kraft Dinner or leftover pasta eaten on the six other evenings of the week. For every status about the beach people are vacationing on, there should be 300 more about the couch they normally spend their days on. The most common negative result of FOMO is a diminished self-image that comes from comparing your life to the seemingly happier ones depicted on Facebook, Twitter and Instagram. It’s important to measure your happiness and success by your own realistic goals. Create an inspiration board full of dreams, hopes and aspirations that you’ve already accomplished or hope to in the future. Instead of staring at pictures of your happy friends having a good time at a party you couldn’t attend, take a look at this board and embrace all the possibilities your future holds. When you realize that online life is doctored to look pleasant all the time, but your own real life is full of potential, you’ll be one step closer to overcoming FOMO. It also helps to set limits for your online use. Since apps make social media sites easily accessible, try disabling notifications or even deleting them all together. Once you get rid of the source of your temptation, your will power will have little work to do. Use social media with good intentions like connecting with old friends and making connections with new ones. If there are people who bring you down, unfriend them or block their posts from appearing on your newsfeed. Remember, it’s about the quality of friends you have, not the quantity. So take charge, brush off your fears and join in. Do you ever fear your friends have more rewarding experiences than you do?